Lubricating Oil Filters: The lubrication system of an engine provides a supply of lubricating oil to the various moving parts in the engine. Its main function is to enable the formation of a film of oil between the moving parts, which reduces friction and wear. The lubricating oil is also used as a cleaner and in some engines as a coolant. Lubricating oil filters can be found both on the suction and discharge sides of the lubricating oil pump dependent on the installation and type of engine or engines. Their maintenance is absolutely critical to the life expectancy of the crankshaft and its bearings, which depends entirely on an uninterrupted supply of clean and correctly filtered oil. The lubricating oil filter is the final barrier preventing particulate matter (solid impurities) from reaching the engine bearings. If the particulate size is greater than the hydrodynamic film thickness, i.e. (0.002 to 0.007 mm) then mechanical damage will occur to the bearing shell wearing surfaces and the journal and crankpin surfaces of the crankshaft. It is a fact that failure to maintain an adequate flow of clean lubricating oil will lead to bearing failure and possible severe damage to the crankshaft. It is imperative that the long, small diameter, filter candles as used in Boll & Kirch type filters are cleaned strictly according to the makers’ instructions. Under no circumstances must dirty cleaning fluid be allowed to flow into the open clean side of the filter candle as it is almost impossible to get dirt out again either by blowing or flushing. Such dirt/impurities, however, will almost certainly find its way directly into the engine once the filter element is back in service. Therefore, when hand-cleaning, the filter candles must stand upright in the cleaning tank (not lying on the bottom) and the fluid level in the cleaning tank must be low enough to ensure no fluid flows into the clean side of the candles. Actual cleaning is done by blowing the filter candles with compressed air cleaning gun from the inside of the filter. The cleaning tank must only be used for cleaning filter candles and for no other cleaning work. On many vessels, the actual cleaning work is usually left to people who do not always realise the importance of proper cleaning, servicing and assembly of sophisticated lub oil filters. It is therefore most important that the Chief Engineer ensures and organises total quality control on this service work. If no strict quality control is carried out the filters may actually cause damage to the engine which they are meant to protect. For this and other mesh-type lub filters, the cleaning procedures on board are to be carefully monitored and verified and any substandard cleaning immediately corrected. Proper assembly and checking that the clean and dirty side of the filter elements are positively sealed against each other (o-ring, gaskets etc. in good order) is essential. Careful study of the filter maker’s instructions and manuals is essential for anybody entrusted with cleaning, servicing and quality control on board. After cleaning, the cleanliness and condition are to be carefully checked and any elements replaced should the filter-mesh be damaged. Throw-away filter cartridges made from cellulose or similar material must never be cleaned and reused. These filters must be discarded when dirty and new cartridges fitted. The use of lubricating oil filter by-pass valves is for emergency operation only and must never be opened during routine starting or running conditions. Particular care must be taken during refitting of filtering cartridges, to ensure that gasket, compression springs etc. are in position and in good condition, in order to avoid any oil bypassing the filtering mesh. Indications of pressure drops and alarms must be maintained operational and must be tested according to maker’s recommendations. Filters do not however address the problem of water contamination, or the large scale removal of solids, which centrifugal purification does deal with. When the engine is not in use for a prolonged period , batch purification of the entire lubricating oil charge whereby it is pumped to the vessel’s renovating tank and then fed by gravity through the centrifugal purification process can remove the contamination from both sources. Centrifugal oil separators must be operated in accordance with the manufacturers’ instructions especially with regard to flow rates and inlet temperatures. 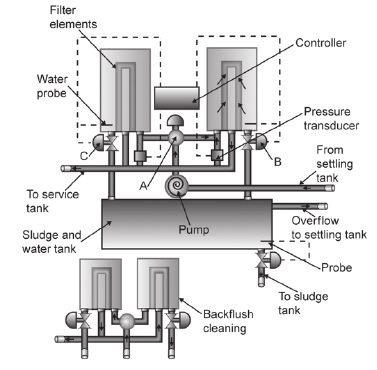 For a 2-stroke engine the flow rate should be adjusted to 2.5 times the sump content per day For a 4-stroke engine the flow rate should be adjusted to 4 times the sump content per day Inlet temperature is usually >85 Deg C.
For fully automatic water/sludge sensing models, the electronic control system must be in full working order as these units cannot operate in manual mode. Operating modes purifier/clarifier or dual role vary from make to make so the actual operating mode for each ship must be fully understood before putting these units in operation. For Gravity disc units, the correct sizing of gravity discs must be fitted depending on oil type, and also the requirement to operate the unit in purifier or clarifier mode. (the de-sludging cycles, if timer controlled should be adjusted to suit the oil quality). When dismantling purifiers for cleaning, extreme care must be taken in handling the various parts so that they are not damaged and the balance lost. If a machine is in the least way out of balance, trouble will soon be experienced with the bowl spindle bearings. Similarly, the cleaning must be properly carried out as again, indifferent cleaning results in loss of bowl balance. The purifier should be carefully examined for corrosion or pitting on any part of the bowl, cover and plates, such corrosion, if found, should be immediately reported. The various pumps must be kept in good order and valves kept tight. All glands and joints must also be kept tight, so that leakage and spillage is kept to a minimum. Purifiers must not be operated with any sight glass open because this allows inflammable gases to escape into the engine room, creating a fire hazard. Lubricating oil samples are to be taken at 3 month intervals unless otherwise instructed and in accordance with these technical procedures. The results of the analysis with makers’ recommendations will be forwarded to the vessel and the Management Office.